Charities face losing at least £250m a year after Brexit, according to new research from the training and publishing charity, Directory of Social Change. The research paper, which is called What does Brexit mean for UK charities’ European Union funding?, says that charities benefited from £258.4m in EU funding in 2015, with £210.9m of that figure awarded to 295 charities in funds administered directly by the European Commission. The paper, which is based on data published through the European Commission’s financial transparency system and by the UK government in 2015, found another £47.5m was awarded to 113 UK charities from European structural and investment funds which were from the EU but allocated by the UK government. But the report says that the figures are minimum levels of funding because only one year’s worth of funding was analysed and because charities often benefit indirectly from other forms of EU investment. The Britain Stronger in Europe campaign estimated before the referendum vote last year that British charities would lose more than £200m in funding a year if the UK voted to leave the EU. 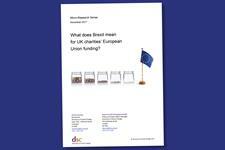 The DSC’s report today calls on the government to clarify the level of funding available to charities through the Brexit process, to consult with the charity and wider social sector about how UK funding is awarded and to commit to replacing EU funding in full after the UK’s departure from the EU. The Chancellor has guaranteed EU funding for organisations until 2020, but has so far not committed to funding programmes after that date. Charity sector bodies, such as the National Council for Voluntary Organisations and the Charity Finance Group, have repeatedly called for EU funding for charities to be replaced once the UK leaves the trade bloc. Daniel Ferrell-Schweppenstedde, co-author of the report, said: “It’s nearly 2018 – but the future of EU funding after Brexit remains extremely murky. Government needs to clarify the situation urgently, because uncertainty is already affecting budgetary outlooks for many charities across the sector.